Part of being a homeowner is making sure that your roof stays in good shape. Your roof is exposed to sun, rain, and wind – all which will inevitably cause wear and damage over time. Because your roof is such an important part of your home, you’ll need to inspect it on a regular basis and then make decisions based on what you find. In some cases, it can be hard for homeowners to determine whether they need a new roof installed or if they simply need to have it repaired. It’s no secret that replacing a roof is a significant expense, and the condition of the roof will help determine the value of your home should you decide to sell it. If your roof is leaking in one small area, odds are, a repair will be sufficient. This is especially the case if your roof isn’t very old. The cost of this repair will depend on various factors. If shingles are missing, whether you repair or replace will depend on how extensive the damage is. A few shingles can be replaced, but if a large percentage of your roof is missing shingles, it’s likely time to replace the entire roof. If your roof’s shingles are worn, it may be possible to simply replace the top layer of shingles. Be warned, however, that this option may not always be the right choice, especially if you plan to live in your home for several more years. The new layer likely will not last as long as it would if the entire roof were replaced, and this fix won’t add to your home’s value the way a new roof would. If your roof is showing signs of decay, it may be a better option to just replace it, especially if you plan to live in your home for a long time. If you are experiencing leaks and your roof is getting older, it may be a worthy investment to completely replace it. If you want to make a significant change to your home’s appearance, a new roof can do just that. You can choose from a very wide range of colors, textures, and materials to customize your home. The only way to know for sure whether you need a new roof or a repair job is to contact DeKalb Roofing Company. We’ll come out to your home, make a recommendation, and provide you with a free, fair estimate. Your roof is a major part of your home, so don’t let a problem with it go for too long – contact us today. This entry was posted in Roofing and tagged free roof estimates, hiring professional roofing contractors, roofing contractors free estimates on January 4, 2013 by DekalbRoofing. Your roof is one of the most important parts of your home, as it is what protects your home from the elements. Many homeowners tend to forget about their roofs – that is, until there is a problem. We at DeKalb Roofing Company encourage homeowners to be vigilant about having their roofs inspected on a regular basis and to contact a trustworthy roofing company if any issues are found. Here are five signs that it’s time to replace your roof. Of course, a leak is one of the most obvious signs that there is a problem. If there is a puddle in your home, don’t delay calling a roofing expert. Also be on the lookout for water spots or stains on the ceilings or walls, as these are signs of a leak. When shingles are missing, your roof is not protected from the elements. At that point, a leak is bound to occur. Curling, bubbling, and/or cracked shingles are warning signs that it’s time to replace or at least repair your roof. It’s important to note that it’s not a good idea to attempt to walk on your roof to evaluate whether your roof needs to be replaced. Cracking shingles are weak, and it is dangerous to walk on a weak roof. Asphalt shingles have a granular coating on them, and over time this coating wears away. 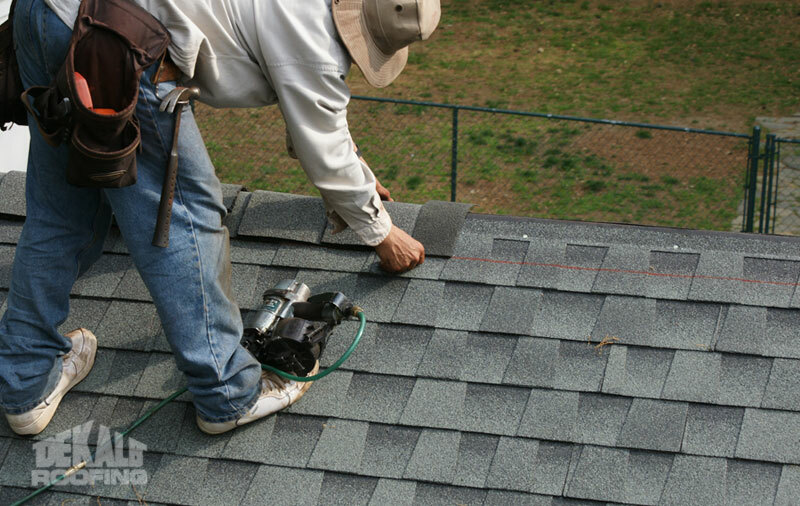 Once the granular is gone, the shingles are much more susceptible to damage. Missing granular on shingles means it is time to replace the shingles. If you are finding a significant amount of granular in your gutters, or if you notice that the granular has worn away, it’s time to contact a roofer. Roof decking is made of wood, which is susceptible to rotting, warping, and infestation. These issues can cause the roof decking to sag. If you notice that an area of your roof appears to be sagging, call a roofing company for an inspection. Rotting wood and mold growth mean water damage, and water damage means it’s definitely time to call a roofer before you have a serious problem on your hands. Algae growth does not cause problems with the roof’s functionality, but it is a cosmetic issue. Many homeowners prefer that their roof be algae-free. If you notice any of the above issues, contact DeKalb Roofing Company. We will come out and do a thorough inspection on your roof and determine whether the issue can be fixed or if the roof needs to be replaced. 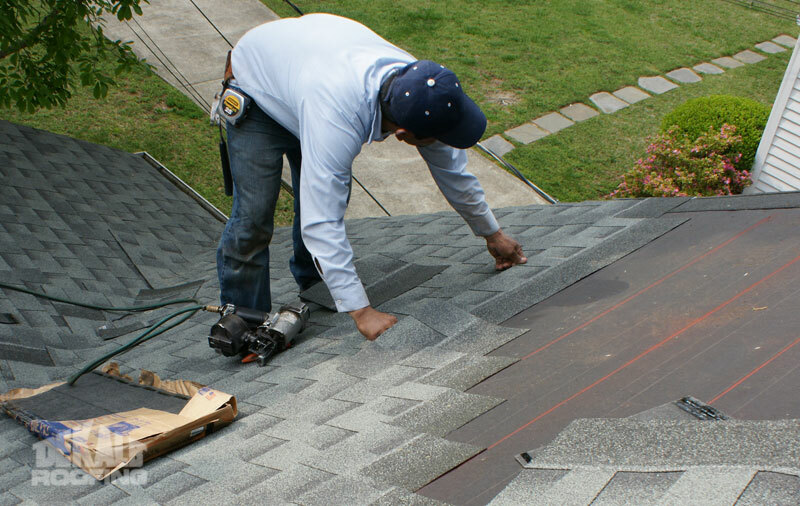 We remove your old roof and quickly get to work installing your new roof. We make sure that your yard is left in excellent condition when the job is completed. 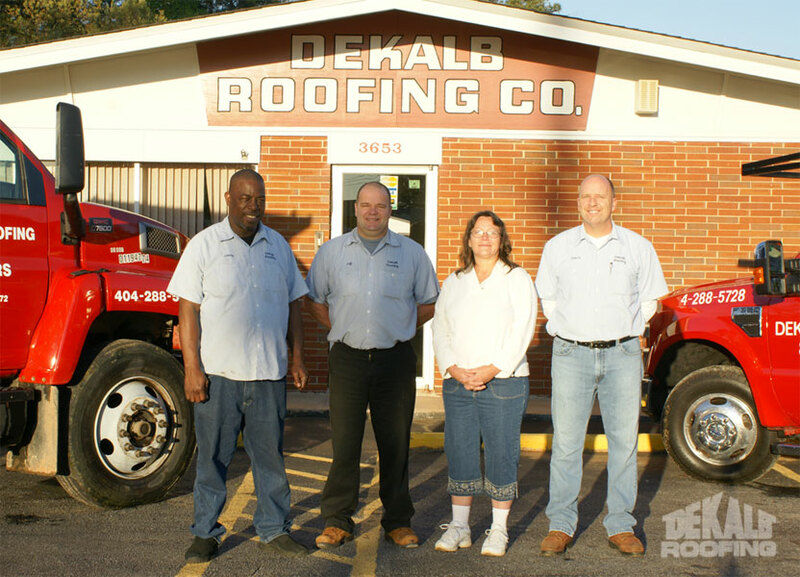 The roofing experts at DeKalb Roofing Company have been helping Atlanta area homeowners keep their roofs in great shape since 1972. When you call DeKalb Roofing Company, you can be sure you are enlisting the help of qualified, trustworthy roofers who will do all they can to provide you with the best service possible. Contact us today for a free estimate. This entry was posted in Roofing and tagged Atlanta re-roofing, atlanta roof installations, free roof estimates, roofing contractors free estimates on July 16, 2012 by DekalbRoofing. Getting a new roof is a major investment and can significantly increase the value of your home or building. Making sure your roof is in good shape is crucial because it protects your home from water damage and other weather-related destruction. Because your roof is such a major part of your home, we take great care to ensure we do the best job possible, from start to finish. Of course, for many people, cost is a major factor when deciding whether to replace a roof and which company to use for the job. Here, we provide information about estimating the cost of your new roof. 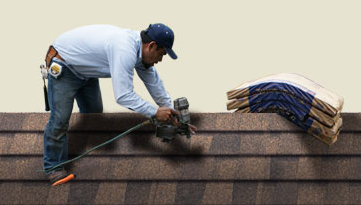 At DeKalb Roofing Company, we provide top-notch service and use high-quality materials for each job. We make it our mission to provide our customers with thorough information about their options so they can make an informed decision. Why Choose DeKalb Roofing Company? 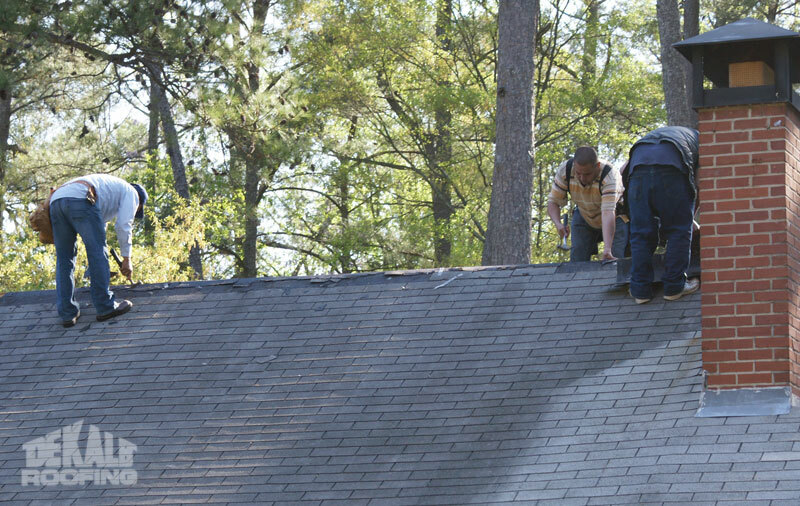 There are many roofing companies in the Atlanta area, so why choose DeKalb Roofing Company? When you call DeKalb Roofing Company to come to your home and provide you with a roofing estimate, you can be sure you are getting a free, fair, and competitive quote. We are upfront and will give you all the information you need to make the best decision for your home. We make it our goal to provide you with a roof that lasts. Most of the products we use have product warranties, and we also provide a 5-year labor warranty. We stand proudly behind our work on each job we complete. If you are considering replacing your roof or gutters, the first step is to get an estimate. Call us at 404-288-5728 to request a free quote. We look forward to providing you with excellent service and a new roof that will exceed your expectations. This entry was posted in Estimates, Roofing and tagged Atlanta re-roofing, free roof estimates, hiring professional roofing contractors, roofing contractors free estimates on June 29, 2012 by DekalbRoofing. Are you a homeowner who needs to replace your old roof or have a new gutter system installed? Are you hesitant to hire a gutter contractor because you were thinking about fixing the gutter yourself? Well, you should know that it is a wise decision to hire a reputable contractor for these projects. Actually, we give you 4 reasons to hire an expert for your gutter installation or new roof installation services. Safety. Rather than completing your roof and gutter installation projects yourself (or at least trying to), it is always a smart idea to hire a contractor who knows how to do it! If you attempt the projects yourself, you are putting yourself at risk for getting hurt because you may not know the proper safety precautions to conform to. Instead, hiring an expert gutter installation company like DeKalb Roofing Company, you can rely on us to do all of the hard work for you! Professional service and customer care. We know that a home is a huge investment nowadays. Making changes to your home and opting for home improvements are also investments, as well. Here at our roofing company, we take pride in treating you with respect, giving you the ultimate customer care service. 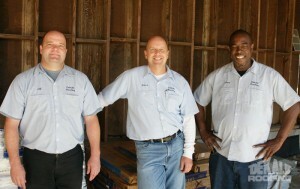 Our friendly installers are knowledgeable and willing to answer your questions if you have any. 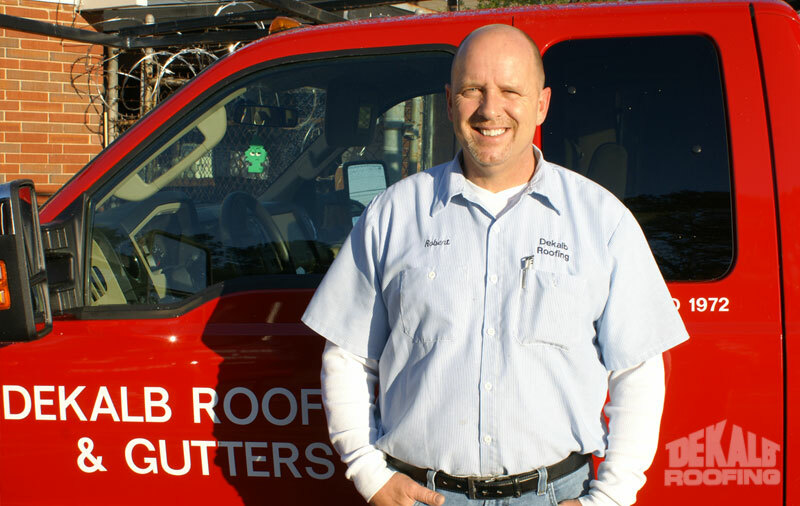 As a matter of fact, each of our roof and gutter installers has been employed within the roofing industry for 10 or more years! So you can count on us to deliver quality, affordable craftsmanship to protect your home for many years to come. 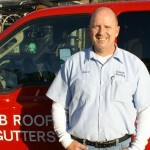 Knowledgeable and experienced in gutter installation. Our philosophy is to do it right the first time. In order to give you these results, we need to employ the best, most experienced installers around. That way, you can feel safe and confident in our services. Actually, DeKalb Roofing Company is proud to say that we’ve been Atlanta’s most trusted roofing experts for the past 39 years! That just goes to show how much experience we have with delivering unparalleled services to our customers, and we want to provide the same results to you and your family, too. Top-notch quality products are used. Our roofing company chooses to use only the best, highest quality products available (i.e. LEAFsolution gutter cover, and architectural shingles). That’s because we want you and your family to be well protected—not just right now, but for long-term maximum protection, as well. You will be happy to know that most of our products come with warranties, too. As an added bonus to you, our labor even comes with a 5-year warranty—so, rest assured, you can look forward to excellent services using only the toughest, finest products on the market! Call us today for your free roofing estimate! Are you ready to make the decision for a new gutter system? If you are interested in hiring an expert gutter installation company, we encourage you to call us today to set up your free roofing estimate appointment! We will help you determine the best ways to give you and your family the ultimate protection when it comes to your roofing and gutter needs. Are you ready for a new roof to protect your home and family? If so, you will be very happy to know that our roofing contractors offer free estimates to Atlanta area residents. You can expect professional customer service, along with exceptional craftsmanship no matter which roofing or gutter installation service you choose. 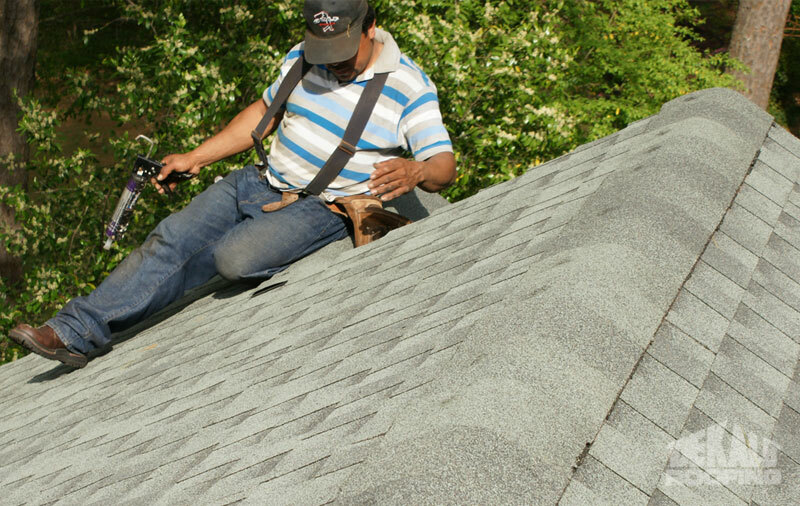 Rest assured, our roofers in Atlanta will not let you down. Actually, our company philosophy is that we do it right the first time. That means we are committed to making you happy and satisfied with our roofing services right from the start! Whether you’d like to revitalize and enhance your home’s exterior with our architectural shingles, or if you’d like us to install the LeafSolution gutter covers, DeKalb Roofing Company has your roofing and gutter installation solutions. When we come out to your home for your free quote, we will take into consideration many factors and thoroughly evaluate your roof and gutters before giving you our professional recommendation(s). Regardless of which solutions we recommend, you and your family can be confident that our quality workmanship produces exquisite results for your home’s exterior appearance, and for your family’s safety. In addition, most of our products are backed by product warranties, as well as the 5-year labor warranty that our roofing company offers—it’s a win-win situation for you! Once we make our recommendations, we encourage you to come to our showroom where you can see first-hand the vast amount of samples we have. Here, you can choose which materials and products you’d like us to use! After you hire us for your roofing and gutter needs, you can expect the same fast, friendly service throughout the entire project(s)! Our customers have always been extremely happy and satisfied since we complete most roofing and gutter projects within 1-2 days. After the project, we will also haul away all debris to leave your yard neat, clean, and beautiful. Using the finest roofing and gutter materials, coupled with our 39 years of experience, you can trust our roofing company to deliver unparalleled results. So, if you’re searching for top-notch roofing contractors, call us today to schedule your appointment. Our goal is to make you happy with every project because if you aren’t happy, we aren’t happy either! 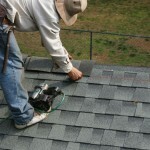 Experiencing a Leaky Roof: Let our Atlanta Roofing Contractors Replace It! You are sitting in your favorite chair in the living room during a heavy thunderstorm, and all of a sudden you hear a dripping sound coming from a nearby room. What a dreaded sound to hear considering you just moved into your new home a few months ago. So now what do you do? Well, if it turns out that you do, indeed, have a leaky roof, our roofing contractors will fix or replace it. At DeKalb Roofing Company, we want you and your family to always be protected from Mother Nature’s elements. That’s why we offer superb roofing and gutter installation services, including fixing leaky roofs. If you hear a dripping sound that might alert you to a leak, there are a few things you should do immediately after detecting a roof leak. The first thing you should do after hearing the dripping sound is to locate where the sound is coming from. Go to the room or area of the house and determine exactly where the problem is. Once the leak is located, clean up the water on the floor first. Then you should place a bucket underneath the leak so the water goes inside of it. An extra, useful tip is to place a towel underneath the bucket so that, when the water drips into the bucket, that it doesn’t splash onto the surrounding floor (causing additional floor damage). At this point, you should call a professional roofing contractor so they can come to your home as soon as possible. They will be able to complete a thorough inspection of your leaky roof to determine where it is leaking, why it is leaking, and how to repair or replace it. The roofing contractor may recommend a new roof if other problems are discovered. It is important to perform these steps immediately after a roof leak is detected. This will prevent further water damage from occurring to your roof and the surrounding areas where the leak occurs. Call us to replace your leaky! When you hire our contractors to fix your leaky roof, you will receive excellent craftsmanship and quality products. We are proud to say that we have been making our customers happy and satisfied for the past 39 years, and we’re ready to make you and your family happy and well protected as well! So if you’d like to take advantage of our roofing and gutter installation services, we encourage you to contact us today for your free quote. This entry was posted in Roofing and tagged Atlanta re-roofing, atlanta roof installations, hiring professional roofing contractors, roofing contractors free estimates on July 27, 2011 by DekalbRoofing. Need a Tucker, Ga. Roofing Company You Can Trust? Do you need roofing or gutter installation services? Are you in need of a roofing company that you can trust with one of your most valuable assets? Well, DeKalb Roofing Company has the perfect solutions and products to meet you and your family’s needs. Located in DeKalb County, Tucker, Georgia is situated 15 miles northeast of downtown Atlanta. With our roofing company being Atlanta’s most trusted roofing experts for the past 39 years, we have been consistently serving our customers with pride and courtesy. Our customers repeatedly tell us how happy and satisfied they are with the professional workmanship that we provide. If our customers aren’t happy, then we aren’t happy either! We stand by our products and services 100%. Actually, we have a 5-year warranty on labor, and we use the best products in the market. For instance, if you are interested in protecting your roof and gutter by having us install gutter covers, we use a product called LeafSolution. The intended use of this product is to keep the debris out of your gutter so the water can run through freely. The more gunk you have inside of your gutters, the less freely the rainwater will be able to run through. This creates water backup, and can lead to serious problems, too. The LeafSolution is just one example of the many finest-quality products we use for your roof and gutter systems! If you’d like to see the products first-hand, we welcome you to stop in to our showroom. Here you can browse through our selection of shingles and other materials so you can decide which products you like best! You can even ask our friendly and knowledgeable associates about the products they recommend to protect your home and your family. Fast, friendly, and professional customer service. A free estimate when we come out to evaluate your roof and gutter systems. When we come to your home for the initial inspection, we will thoroughly evaluate your roof and gutters before giving you our recommendation(s). You and your family can be rest-assured that our quality workmanship produces exquisite results for your home’s exterior appearance, and for your family’s safety. Best of all, most of our products are backed by warranties, which means you and your family can enjoy them for many years to come. If you live in the area, and need a roofing company that you can trust, contact us today. In addition, you can schedule your appointment for the roofing or gutter installation services we offer. Call today! This entry was posted in Roofing and tagged hiring professional roofing contractors, roof and gutter installers, roofing contractors free estimates on July 7, 2011 by DekalbRoofing.